Lee Molyneux on the ball against Yeovil. 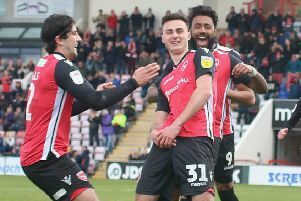 Morecambe boss Jim Bentley has challenged his players to finish the League Two season in style. The Shrimps host Newport County tonight, coming on the back of consecutive 3-1 defeats against Blackpool and Yeovil Town. That leaves them 15th in the table, eight points off the top seven with 11 games of the season remaining. Their performances have come against a backdrop of well documented off-field squabbles, which emphasises the job done by the Shrimps’ camp. “We have done alright to be where we are,” Bentley said. “We have to win games and try to finish as high as we can; we were frustrated against Yeovil but we’re now moving on. “I can’t affect what goes on off the field but it’s been a nightmare. “A lot of things need sorting but it is what it is; credit should go to everyone because we’ve battled away and now we’re looking forward to the run-in and we want to win as many games as we can. “We have the same number of points (46) as we managed last season but the run-in coming up is a quarter of the season and we have to make sure we do the right things. Defeat against the Glovers on Saturday was especially disappointing, not least the way Bentley’s players became increasingly ragged after Antony Evans had got them on level terms early in the second half. Defensive errors led to Alex Lacey and Bevis Mugabi’s goals which gave Town victory, one which could have been more emphatic in the final stages. “It was a frustrating time for us because we couldn’t seem to do the right things,” Bentley said. “We went very ragged but we still got in; Paul Mullin had a chance to make it 3-2 but, even though he was in decent form, he snatched at the opportunity. “All over the park we didn’t hit the heights; the decision making was wrong in terms of when to pass, dribble and shoot.